Let’s call this Training Week. Pigs learn fast. It’s very much fun to be doing actual training with the critters. Pigs learn really fast, and Tethys is eating cookies within touching distance already, so I’ve moved on to teaching her to recognize her name. This is an easy process: I say her name, then I give her a cookie. She’ll probably have it down by this weekend. Tethys eating a cookie right by my feet! Janus is taking a little longer learning to approach, but he’s getting there! The difficulty of pigs of course course is that while they’re smart as hell, they’re not naturally inclined to listen to human voices and watch human faces like dogs are. Selective breeding makes an enormous difference in animal behavior, really, and nothing will make that more clear than playing training games. The Soays present an even bigger conundrum: I’m still looking for an easy reward that they find meaningful. The ewes Lady Jane and Gwendolyn are easy: they want me to go away. So I walk up as close as they’ll let me, stand for a moment, tell them “Mamogion da!” (Good ewes! In Welsh) and then turn and walk away. I’ve successfully halved their flight distance using this and grain. 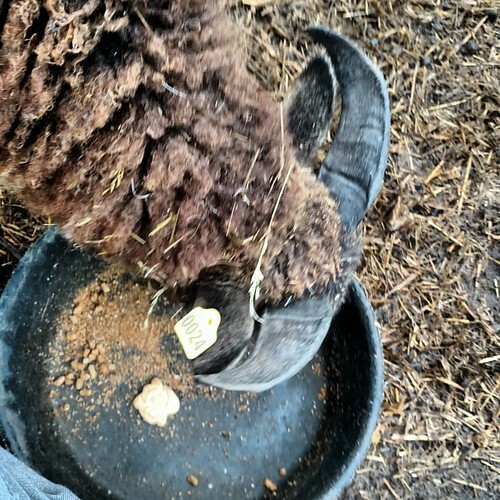 The wethers however are much more human-social, yet not big on cookies. Reuben says cookies just aren’t that interesting. They are enthused about the little bit of sweet feed they get, but it’s really difficult to use that in discrete chunks as a reward. I may end up making little wodges of oats stuck together with molasses and baked dry to try. Even if the sheep don’t eat them, the goats most certainly will, so they won’t go to waste! Meanwhile Sebastian is learning to target and touch my open hand, which is a necessary first step to teaching him to lead with a halter instead of his current behavior when I try to lead him, which involves bracing his legs and becoming immovable. Sebastian will target all day if your hand smells of cookies. Sebastian has really mastered cookie Zen, which means he gets to move on to things like targeting and learning to wear a harness. His half-brother Sanglant is still really struggling with the idea that to get the cookie, you shouldn’t try to get the cookie. 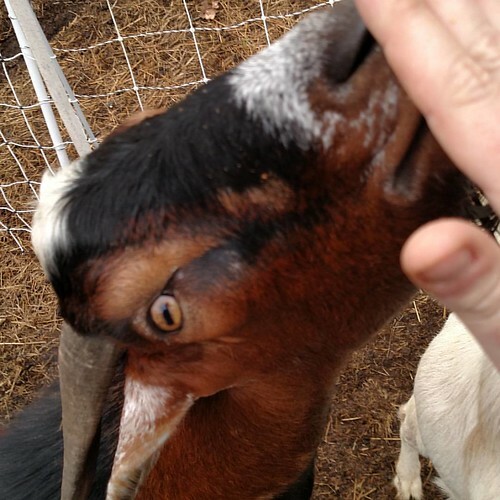 Every fiber of Sanglant’s curious and determined goat brain wants to treat my hand like a puzzle toy, but he’s finally beginning to back off and accept that only through patient waiting will cookies come to him. The one thing I don’t have pics of, because I need to enlist my husband, is teaching Ella the American Blackbelly ewe to do classic obedience healing. She’s been offering it voluntarily for a few months when I have the grain scoop, so I figured why not work on putting it on cue? Hopefully I can get pics in time for Friday’s post! Janus and Tethys root around for food. After a week I’m pleased to report that Janus and Tethys the potbelly pigs are settled in beautifully. They’ve embraced their new jobs as tillers of compacted soil, disposal units for leftover grain from ruminants, and makers of adorable oinking noises. As predicted, they now know I’m the Food Lady and recognize the grain bucket, coming on the run to line up for breakfast. They haven’t lost a whole lot of weight yet, but they HAVE built enough muscle in their backs to hold their bellies off the ground. 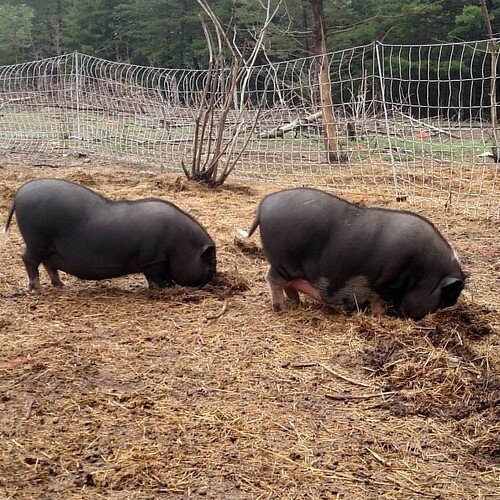 They no longer move stiffly, but confidently and comfortably, and as far as I can tell they’re having a grand time rooting through the ruminant pen in search of grubs and roots or whatever it is pigs are after. 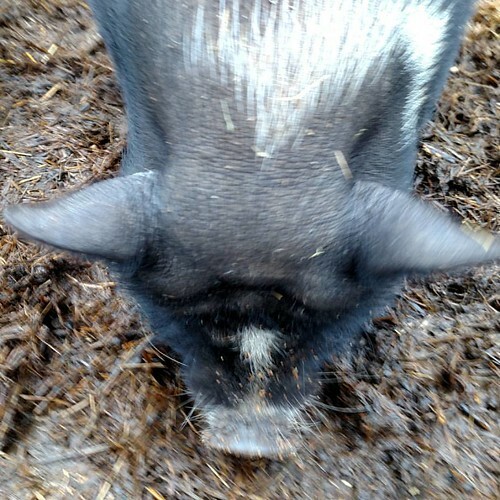 In their constant foraging they turn over the top two to four inches of ground, and then the chickens and guineas come through and comb through the disturbed earth for whatever seeds and bugs the pigs missed, leaving a layer of loose, smooth soil behind. All of which tells me that my master plan is working and I probably won’t have to turn over garden beds myself unless I really want to. Tethys is much more inclined to be social than her brother. Yesterday morning she even let me scratch her back while she ate breakfast, despite Janus’s insistence that I was not to be trusted. They’re blooming into lovely animals, bright-eyed and curious, and I’ve assured Janus that even if he never wants to cuddle he can still stick around to till the pastures.